Alabama workers' compensation benefits provide payment for benefits including medical and lost benefits for workers who suffer occupational health problems or who are injured on the job. Compensation and the necessary medical care are generally limited to personal injuries which occur during the course of employment. If the worker is killed from a work injury, compensation may also be extended to the dependents of the worker. Injured employees do not have to prove the employer is at fault for their Alabama work injury to receive compensation, but workers compensation does limit the employee's ability to sue the employer (unless the employer denies workers' compensation benefits). Alabama workman's compensation is viewed as a compromise, limiting the worker's ability to sue while providing compensation for work injuries. Employees may forfeit their right to Alabama workman's compensation by willfully injuring himself or others, or using illegal drugs or alcohol. More information can be found in the Code of Alabama, with supplements, beginning with Volume 15, Section 25-5-1. The Workers' Compensation Division in Alabama is responsible for managing workers compensation in the state of Alabama. Their duties include: compliance inspections, compiling injury and cost statistics, safety promotion, auditing and enforcing claims payments and settlements, dispute resolution, and regulating costs. Most private employers in the state of Alabama who employ more than four full or part-time workers must provide workers' compensation coverage (exceptions exist in Code of Alabama 1975, § 25-5-50(a)). Workers' compensation purchased from a commercial workers' compensation carrier. Workers' compensation purchased through an Assigned Risk Pool. Workers' compensation purchased through a group self-insurance fund. Workers' compensation purchased through a self-insured plan. Under this plan the workers' compensation coverage is assumed by the company. 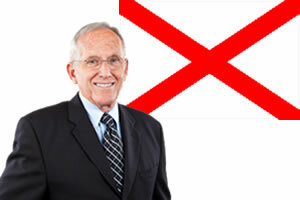 The company must meet the qualifications outlined in under Alabama's Workers Compensation laws. Alabama workers' compensation laws specifically cover work injuries which "arise out of and in the course of employment". This can include not only work related injuries but also occupational diseases that were "caused by a hazard recognized as peculiar to a particular trade, process, occupation, or employment as a direct result of exposure over a period of time to the normal working conditions of such trade, process, occupation or employment". Although employers are required to provide adequate training to reduce or eliminate work injuries, regardless of training or the safety precautions, work injuries do occur. Common work injuries can include: back and neck injuries, burns, abrasions, heart attacks, carpal tunnel syndrome, amputations, and diseases caused by exposure to harsh chemicals or toxins. If a worker's injury or illness meets the criteria specified under Alabama work comp law, the employer is required to provide medical benefits, lost wage compensation and death benefits (if the worker dies from their work injuries or illness). Temporary Partial Disability Benefits – Temporary partial disability benefits may be paid if the worker is able to work but has lost some amount of wages due to their work injuries. Compensation is based on two-thirds of the difference in the employee's earnings before and after the Kansas work injury. Temporary partial disability benefits are limited to a maximum of 300 weeks. Temporary Total Disability Benefits - Temporary total disability benefits may be paid if the worker is unable to work in any capacity due to their work injury or illness. Compensation will be equal to two-thirds of their average weekly earnings for the fifty-two week period before the work injury. Permanent Partial Disability Benefits - Workers who are partially and permanently disabled from their work injury or illness may be compensated. The amount of compensation is determined by the extent of the work injury. Alabama state laws provide a list of possible work injuries and the amount the state will compensate per work injury. The maximum amount of permanent partial disability payment the state will provide is $220 per week. Permanent Total Disability Benefits - Permanent total disability benefits may extend for the duration of the work injury or disability and are equal to two-thirds of the total weekly earnings at the time of the work injury. Some workers may also choose to take a lump sum payment for work injury (if the court and both parties agree). Compensation does not accrue until the 4th day of disability but if the work injury continues for 21 days the first three days may be compensated. Alabama workers' compensation laws require employees to provide reasonable and necessary medical care to injured employees. Necessary medical care can include: medicine, medical treatment, surgery, medical supplies, and other apparatuses needed by the employee. Employees who are not satisfied with their initial treating doctor who was selected by their employer may request a new physician. Employees who do not comply or do not accept the medical treatment provided by their employer may forfeit their right to compensation for the refusal time period. If a worker dies from a work injury within 3 years from the date of the injury the dependents may be eligible to death benefits. If the worker has one dependent the dependent is eligible to receive 50% of the employee's average weekly earnings. If the deceased worker has 2 or more dependents they will split 2/3 of the worker's average weekly earnings. Dependents can include a wife, child, husband, mother, father, grandmother, grandfather, sister, brother, mother-in-law or father-in-law if they are supported in full at the time of the worker's death. Death benefits may also include up to $3,000 in burial expenses. Death benefits may be paid for 500 weeks but may stop if the dependents die or if the spouse remarries. If you have been injured in a work-related accident in Alabama it is important to notify your employer by written notification within five days from the date of your work injury. The courts have suggested oral notification may be honored, but written notification is preferable. Failure to notify your employee within 90 days from the date of the work injury could result in forfeiture of workers' compensation benefits. Alabama workers comp laws can be complicated, and the rules and regulations are subject to change. It is important to consult with an Alabama workers' compensation lawyer as soon as possible if you have been injured in a work-related accident.